Help Us STOP Anti-Gun HF1393! Anti-gun politicians are fighting tooth and nail to pass HF1393, a bill that leaves us WIDE OPEN to attacks on our gun rights. For the details on what this bill would do, please watch the video from our Political Director below. 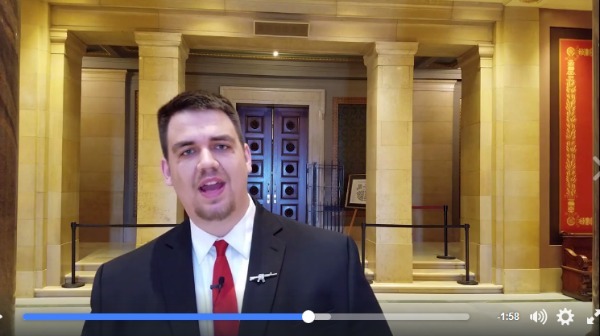 When you’re done watching the video, call your representative and tell them to vote NO on HF1393. Tell them that instead of pushing back-door gun control, PASS Constitutional Carry legislation instead! To find out who represents you – GO HERE. This bill has only been stopped so far because of all the pressure you and other gun owners have been pouring in to the capitol this session. Let’s make their phones glow all week long so that they understand if they vote against your gun rights, they’re going to be out of a job! And if you can, please consider a contribution of $25 or even $10 to help us in these fights. Whatever you do, make the phone calls, as that’s most important. Thank you for always standing with us to defend the Second Amendment. The left wing, liberals, socialist, regressive progressives, snowflakes what ever you want to call them, are so wrong. They spread lies, misinformation and fear mongering. Since gun ownership has gone up by law abiding citizens, gun crimes has gone down. There are far more deaths caused by drunk people driving, Lets out law alcohol and cars. A semi-auto AR-15 is NOT an assault rife, an full-auto M-16 is. An AR-15 is Not a high caliber round, it is a medium caliber. In fact in most states the .233 round, which the AR-15 uses, is barely large enough to legally hunt with. Minnesota is one of those states. The second amendment doesn’t guarantee our right to bear arms, the bill of rights does that. The 2nd amendment say that that right can NEVER be infringed upon by the government or anyone else. ALL the mass shootings have been in “gun free zones”, not where citizens maybe/ are armed. There where never any gun laws until Franklin D. Roosevelt, who was an anti-constitutionalist and believed that the government should be taken out of the people’s hands, took office. Any politician who wants to remove any part of the 2nd amendment lied when they took their oath of office to protect the constitution. I took a solemn oath to protect my country and constitution from ALL enemies, foreign and domestic. The Bill of Rights and 2nd amendment never categorizes types of weapons. Remember “Wounded Knee”, the largest mass murder in American history committed by the U.S. government while trying to disarm people they saw as a threat. That is the reason for the 2nd amendment exists. Only tyrannical governments disarm their people then they start murdering them. It seems like that is the end all that our government is trying to do and don’t deny it. All politicians who are “anti-gun” need to get rid of their armed guards for themselves and families. Otherwise they are cowards and hypocritical. Do your job, do your own research, please. Don’t believe Hollywood or the media. Remember, a cancelled carry holder may just save you or one of your loved ones someday.